Growing up in Tokyo, Dr. Shuichi Suzuki was well aware of the destruction that stroke can cause. Stroke was Japan’s No. 1 cause of death at the time. He knew neighbors who died of stroke, was aware of others who suffered life-changing disabilities, and saw how the disease affected not only the patients, but also their loved ones. 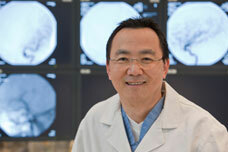 Today, Suzuki is a UC Irvine neurointerventional radiologist and vascular neurologist, skilled in intricate stroke treatment techniques that use tiny catheters to restore blood flow to blocked brain arteries. He is among the first generation of neurointerventionists who are redefining stroke care, saving patients who two decades ago would have died or survived with serious disabilities. “These are revolutionary treatments,” says Suzuki, an integral member of UC Irvine Healthcare’s Stroke & Cerebrovascular Center. Fifteen years ago, stroke treatment leaped forward with the U.S. Food and Drug Administration’s approval of intravenous tissue plasminogen activator (IV tPA), a clot-busting drug. The drawback: tPA must be given within the four hours after a stroke, and patients often are not taken to an appropriate hospital or diagnosed in time. Only 3 to 5 percent of stroke patients get IV tPA, says Suzuki. When it is too late for tPA or the drug fails to dissolve the clot, Suzuki opens the blocked artery by inserting a microcatheter – a plastic tube with a diameter of 0.014 inch, barely bigger than a human hair – into the femoral artery in the groin. Guided by advanced imaging technology, he threads the catheter through the patient’s blood vessels, up into the brain. Once the catheter reaches the blockage, Suzuki can utilize two different techniques approved in recent years that can remove the clot. One, called clot retrieval or embolectomy, uses the Merci Retrieval System® to capture the clot in a corkscrew-like tip and pull it out. The other is clot aspiration using the Penumbra System® to suction the blockage from the artery. Sometimes Suzuki must use both techniques to remove all traces of the clot.